Black truffles, referred to as “b lack diamonds,” have been proposed as an aphrodisiac as far back as ancient Greece. But these subterranean gastronomic gems are only half of what makes Moliterno with Black Truffles “umami” – in the most deeply savory sense of the term. e. Moliterno wheels are deeply etched from the grass-woven baskets they are drained in, and therefore the cheese is also known as “pecorino incanestrato” (meaning “in basket”). Traditional vinegar and oil rubbing during the maturation process preserves both essential moisture and flavor. Unlike other methods of introducing truffles into cheese, these Sardinian Moliterno wheels are allowed to age for around 6 full months before being injected with pure, authentic black truffle paste. Over an additional five months of aging, the infusion transforms the cheese into a blend of seductive flavors and aromas that require a “need to taste for yourself” label. The prominent dark truffle veins crisscrossing the gray-yellow cheese are visually striking and although the look is concentrated, the veins impart their beguiling flavor throughout the entire semi-hard and slightly crumbly paste. Describing the intimate sensations individuals experience upon sampling Moliterno al Tartufo is difficult but: exotic, addictive, luxurious and intense are a few tangible words for this amazing and elegant cheese. Application: A little goes a long way in any application of this cheese. 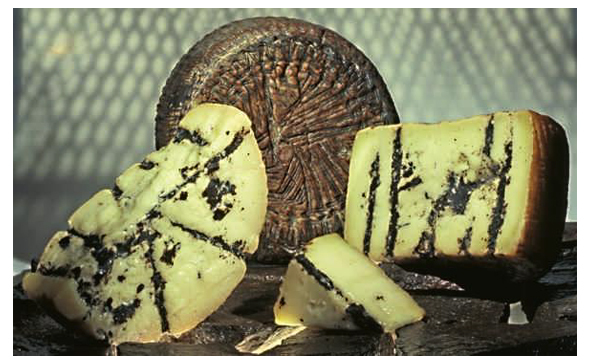 Outstanding on a cheese board, Moliterno with Black Truffles is also incredible grated over risotto, pasta, polenta or egg dishes. Pairing: Best choice is a big, earthy Italian red wine. A good quality Chianti Classico or Barbara d’Asti would be a delicious complement, but if a Barolo or Barbaresco is obtainable (with enough age to have softened the tannins) that would be an ideal pairing. Il Forteto’s Millefiori (1,000 Flowers) Honey is derived from bees that populate and pollinate the vast Tuscan hillsides lush with a wide variety of wildflowers. As a result, this top quality, all natural “liquid gold” has a well rounded, complexity and a sweet, floral aroma. Lovely lemon-amber in hue and soothingly thick and granular in texture, Il Forteto Millefiori Honey is great for glazing chicken or pork and is a delight drizzled on crusty bread or pecorino.